The fall season brings changing colors, crisp nights, and lots of reasons to gather with family, friends, and coworkers to celebrate and enjoy each other’s company. Good food and drinks are the finishing touch on any such occasion and we’re excited to introduce Passed & Paired to make your event perfect. Passed & Paired was designed by our Chefs and Mixologists to pair delightful appetizers with handcrafted cocktails complementary of the unique tastes of each element. 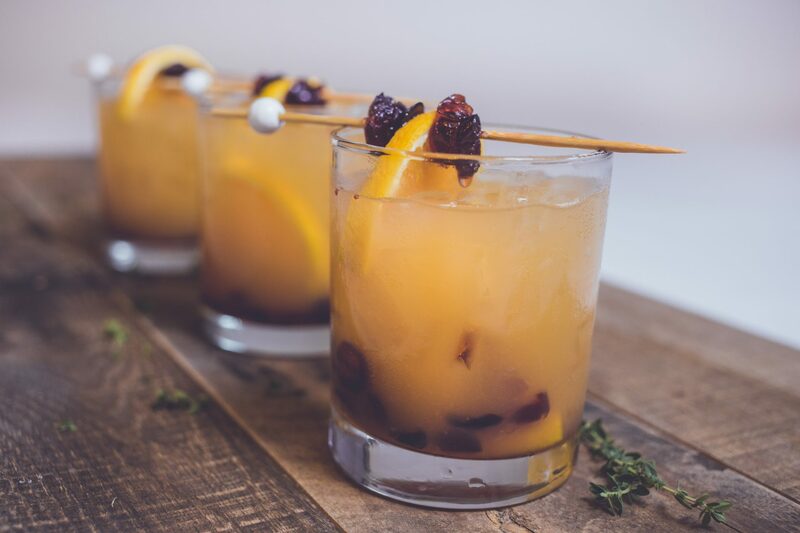 Our empanadas are stuffed with braised beef and slow roasted vegetables which are perfect accompanists to the cranberry and orange flavors in the Maker’s Mark cocktail. These quinoa cakes are made with smoked golden raisins, black-eyed peas, kale, and sweet potatoes. A twist on the classic Moscow Mule, our Missouri Mule combines ginger kombucha, lime, and vodka for a zesty cocktail. Classic Cajun spiced shrimp with goat cheese and spinach are perfect with your favorite fall seasonal beer such as Oktoberfest or Brown ales. In addition to these Passed & Paired options, we’ve developed two additional cocktails perfect for the changing season. Our house infused pear vodka is mixed with lemon juice and house infused rosemary thyme simple syrup then poured into a flute. Champagne tops the glass, and fresh thyme garnishes the cocktail adding to the aromatics of this delicious cocktail. This cocktail is a unique combination of house infused citron vodka, fresh lime & grapefruit juices, and a special fizz element. When shaken with ice the cocktails forms an attractive fizz. It is served on the rocks with a sugared rim and garnished with grapefruit peel. Contact us to plan a Pass & Paired menu perfect for your fall or holiday party at the office, your home, or any venue in the Columbia, Jefferson City, or St. Louis areas.